Almond flour is—to put it as simply as possible—ground almonds. Making almond flour is a pretty straightforward process, so it's actually easy to do at home. Start with blanched, skinned almonds (often sold as slivered almonds) or blanch and skin whole raw almonds yourself. 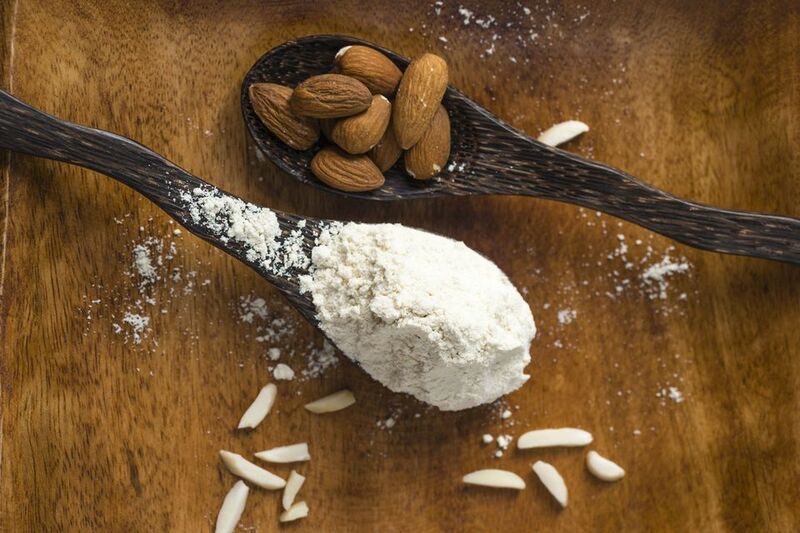 Every 1 ounce of whole almonds will yield about 1/4 cup almond flour. If you're starting with blanched and skinned almonds, skip ahead to step 5. To blanch and skin raw almonds, bring a large pot of water to a boil. When the water is boiling, add the almonds. Boil for about 1 minute. Drain and rinse with cold water until cool enough to handle. The skins will slip right off, so simply pull them off and discard. Lay the almonds on a clean kitchen towel or several layers of paper towels and let sit to dry thoroughly (at least several hours and up to overnight). Put the blanched, skinned, dry almonds in a food processor. Pulse until they're ground into a sand-like texture. Note: Almond "flour" will never be as fine as wheat flour. The nuts will actually turn to almond butter instead of powder, so only grind it as fine as sand, and don't try to get it as fine as wheat flour. Since the nuts are blanched before they're ground, the flour doesn't have a very strong, distinctive almond flavor, but it's not completely lacking in it, either. The best way to describe it may be to say that it adds a gentle, slightly nutty aroma to what you're making. When used as a main ingredient, an identifiable almond note will no doubt come through. Unlike flour milled from grains, it's okay to eat almond flour raw, so go ahead and taste a bit of it if you're interested. In recipes that don't depend on gluten to create structure (i.e. risen breads and other things made from yeasted doughs), you can often substitute almond flour one-for-one for wheat flour. It's particularly good for simple desserts such as cookies or bars. The texture of the final item will often be heavier and the batter may require extra liquid, but a bit of experimenting can often yield excellent results. First-time testers can start by replacing 1/4 of the wheat flour with almond flour. It's great this way in pancakes, scones, muffins, cookies, and even puddings. Adding almond flour to brownies makes them extra fudgy as well. If you're unsure about ratios, use a recipe specifically created to use almond flour, such as these almond flour biscuits, almond flax muffins, or this almond ring cake. While delicious and nutritious, almond flour doesn't behave exactly like wheat flour and can't be used one-for-one in all recipes. For yeasted breads and other baked goods that depend on the structural integrity that gluten provides, almond flour can only be used to replace a small portion of wheat flour. Almond flour works very well as a breading agent, like when coating chicken or pork cutlets to pan fry. It's also an excellent way to thicken soups or stews—simply sprinkle and stir in—or as a breadcrumb substitute in meatloaf and meatballs. Almond flour has 138 calories per 1/4 cup serving, along with 5 grams of protein, 6 grams of carbohydrates, and 11 grams of fat. It's cholesterol-free and a good source of dietary fiber (3 grams), vitamin E, folate, and niacin. Since it's made from just nuts, almond flour is also an excellent source of omega-3 fatty acids. Almond flour is gluten-free, which makes it appealing if you have celiac disease. It also has a high-protein that works for certain diets. Almond flour also tastes good and creates a distinctively chewy element to baked goods (like macarons! ), which is why many cooks love to find ways to incorporate it into their repertoires. Since almond flour is gluten-free, it can't be used as if it were wheat flour—gluten is the protein in wheat that creates structure in bread and the bread-like texture in other baked goods. Because almond flour is simply ground almonds, it can go rancid much faster than grain flours. Store it in the fridge, or even in the freezer, and use it within a few weeks.